Immunity-Infection-Vaccination, Centre International de Recherche en Infectiologie (CIRI), Lyon, France. ABSTRACT : Crystal structures such as monosodium urate (MSU) crystals or cholesterol crystals can trigger an inflammatory response responsible for chronic diseases. These crystals are internalized by immune cells and activate the NLRP3 inflammasome, a multiprotein signaling complex of the innate immune system. That leads to the activation and secretion of the pro-inflammatory cytokines IL-1β and IL-18, which triggers inflammation. It is not well understood by which mechanisms crystal structures activate NLRP3, but it seems that reactive oxygen species (ROS) and lysosomal proteases are involved in this process. In this review we explain how crystals could trigger NLRP3 activation, and we describe the different crystal structures and the diseases that they can cause. The NLRP3 inflammasome is a multiprotein signaling complex of the innate immune system and controlling the secretion of the pro-inflammatory cytokines interleukin-1 beta (IL-1β) and interleukin-18 (IL-18) in response to infections and tissue damages, which activate the inflammatory response. The NLRP3 inflammasome can also trigger a cell death program called pyroptosis. It is composed of the NLRP3 protein ( nucleotide-binding domain, leucine-rich repeat (LRR) and pyrin domain containing gene ), also called NALP3 or cryopyrin, which is encoded by the nlrp3 gene located on chromosome 1. The NLRP3 protein is a cytosolic pattern recognition receptor (PRR). It contains a NACHT nucleotide-binding domain which is thought to play a role in the oligomerization of the proteins, carboxy-terminal leucine-rich repeats (LRR) involved in sensing the pathogen and damage, and a pyrin effector domain (PYD) ●. The NLRP3 protein is normally auto-repressed probably due to an interaction between the NACHT domain and the LRR, but in presence of pathogen-associated molecular patterns (PAMPs) or damaged-associated molecular patterns (DAMPs), this repression is abolished and NLRP3 undergoes a conformational change ●●. NLRP3 then assembles to the adaptator ASC (apoptosis associated speck-like protein containing a CARD) via its PYD domain which binds pro-caspase 1 using its caspase recruitment domain (CARD) ●●. This multimeric complex constitutes the active NLRP3 inflammasome (Figure 1). Then pro-caspase 1 is cleaved, triggering the activation of caspase 1 which cleaves pro-IL-1β and pro-IL-18 into their secreted forms IL-1β and IL-18 ●●. NLRP3 inflammasome is expressed in macrophages, dendritic cells, neutrophils, B cells, T cells and some epithelial cells . Figure 1. NLRP3 inflammasome structure. NLRP3 inflammasome is composed of three proteins: NLRP3 and ASC which are assiociated via their PYD domain, and pro-caspase 1 which binds ASC using its CARD domain. The NLRP3 protein is composed of 4 domains: LRR, NAD, NACHT and PYD. ASC is composed of 2 domains: PYD and CARD. Pro-caspase 1 is composed of 2 domains including CARD. Activation of the NLRP3 inflammasome requires 2 signals: signal 1, also called priming signal, and signal 2. NLRP3 can be activated during infection with pathogenic bacteria such as Escherichia coli , viral pathogens including Influenza A virus and fungal pathogens such as Candida albicans . But it can also be activated when no pathogen is present, such as in gout disease ●. The priming signal acts via the NF-κB pathway which activates gene expression, leading to the production of NLRP3 and pro-IL-1β [6,7]. It could also lead to NLRP3 deubiquitination by BRCC3, which is a required step for inflammasome activation . In infectious contexts, signal 1 is mediated by PAMPs such as lipopolysaccharide (LPS), unmethylated CpG dinucleotides and zymosan which are recognized by toll-like receptors (TLRs) including TLR2, TLR3, TLR4 and TLR7 [6,9]. In non-infectious contexts, other molecules such as tumor necrosis factor-alpha (TNF-α), IL-1α, IL-1β and oxidized LDL (oxLDL) can prime NLRP3. The second signal leads to NLRP3 inflammasome activation following the priming step. In infectious contexts, signal 2 is promoted by microbial patterns such as virus components and bacterial toxins, or by DAMPs including ATP released by dying cells. In non-infectious contexts, signal 2 is mediated by DAMPs or crystal structures . This review focuses on NLRP3 activation in non-infectious context when NLRP3 is activated by crystals, also called particulate matter. There is a wide variety of crystal structures with different compositions that can trigger NLRP3 activation. These crystal structures can be endogenous, as for example monosodium urate (MSU) crystals, calcium pyrophosphate dihydrate (CPPD) crystals, cholesterol crystals and amyloid β fibers, or exogenous as silica crystals, asbestosis fibers and aluminum salts, and are responsible for chronic diseases like gout disease, pseudogout disease, atherosclerosis and silicosis [9–11]. Here we summarize the diseases caused by the different crystal structures, we present an overview of the current understanding of NLRP3 activation by crystal structures and we describe the different mechanisms that are likely involved in this process, enouncing the main theories emitted to date. The inflammatory response is known to play a key role in host defense, particularly against infections. But it is also known that inflammation can cause collateral damages in tissues. The inflammatory response can be triggered by microbes but also by crystal structures. The host defense function of inflammatory response to crystals is unclear since the particles may not be dangerous by themselves for the organism and the inflammatory response fails to clear the crystal structures. However, the damages caused by the particle-induced inflammatory response lead to chronic diseases. One of the best characterized crystal-induced inflammatory diseases is gout. Gout is a metabolic disease caused by an increase in purine degradation and leading to hyperuricemia. In hyperuricemic patients, uric acid forms monosodium urate (MSU) crystals accumulating in joints ●. Joint resident macrophages incorporate the crystals in order to eliminate them. This crystal uptake was shown to activate NLRP3 inflammasome in macrophages . This leads to IL-1β activation and secretion . IL-1β triggers the inflammatory response by recruiting monocytes and neutrophils in joints, interacting with IL-1 receptor which starts a signaling pathway dependant on MyD88 . Similarly to resident macrophages, the recruited leucocytes fail to eliminate the crystals but their inflammasomes end up activated. They release IL-1β, which continues and amplifies the inflammatory response. This give rise to gout crises, reflected in great pain at joints. Gout crises frequency increases over time in patients suffering from gout disease. In pseudogout, another crystal-induced inflammatory disease, similar to gout, calcium pyrophosphate dihydrate (CPPD) accumulate in joints and form crystals. As in gout, these crystals lead to chronic inflammation in joints, dependent on the activation of NLRP3 inflammation and secretion of IL-1β . Atherosclerosis is an inflammatory disease responsible for many cardiovascular diseases. In atherosclerosis, cholesterol accumulation at the artery wall leads to the formation of atheromatous plaques where the cholesterol crystallizes. Resident macrophages incorporate the cholesterol crystals which activate NLRP3 . IL-1β cytokine is produced, leading to monocytes recruitment under the endothelium (subendothelial space) . The recruited monocytes differentiate in macrophages and in turn participate to the inflammation by secreting IL-1β. This inflammatory response caused by cholesterol crystals contributes to atheromatous plaque growth that can lead to the rupture of the endothelium. If the endothelium undergoes physical rupture, the consequences can be tragic: blood platelets aggregate at the artery wall and a clot is formed, which can totally block blood flow in the artery. Cholesterol crystals which have sharp edges could be directly involved in this rupture by perforating the endothelium ●●. In Alzheimer's disease, neurons from the cortex of the brain die which leads to dementia. Here amyloid-β fibers are involved. These fibers form senile plaques and are produced by the aggregation of Aβ peptide in the extracellular space . Aβ peptide itself is obtained by the abnormal cleavage of amyloid precursor protein (APP) by β-secretase. Aβ fibers trigger NLRP3 activation in microglial cells and lead to IL-1β secretion [17,18]. The persistence of amyloid fibers in the brain leads to chronic inflammation which is thought to play a role in neurodegeneration ●. Silica and asbestos are silicates that may be found in the air in the form of small particles. They can be inhaled and cause diseases like silicosis, asbestosis and lung cancer . Silicosis and asbestosis are pulmonary fibrosis which means that pulmonary parenchyma is slowly converted in conjunctive tissue following silica or asbestos prolonged exposure. This leads to irreversible decrease in oxygen diffusion capacity and so breathing problems. Chronic inflammation is linked to these diseases . It was shown that silica crystals and asbestos fibers trigger NLRP3 activation and lead to IL-1β secretion ●. The different crystal structures and their associated diseases are summarized in Table 1. Table 1. : Crystal structures and related diseases associated with NLRP3 activation. : Crystal structures and related diseases associated with NLRP3 activation. Aluminum salts are used as vaccine adjuvants, and they form crystals in alum preparations. TiO2 and SiO2 nano-particles are nano-materials used for manufacturing industrial items such as plastics and cosmetics. Aluminum salt, TiO2 and SiO2 particles were shown to trigger NLRP3 activation, but it was not proved that they cause diseases [20,22]. The activation of the NLRP3 inflammasome requires 2 signals. Crystals constitute the 2nd signal. We will see how the priming signal is promoted in non-infectious context. In many cases, including inflammatory diseases such as gout, no pathogen is involved in the inflammatory process, then referred to as sterile inflammation. In this case NLRP3 is not primed by microbial components but by other molecules including cytokines. Tumor necrosis factor alpha (TNF-α) was identified as a possible priming signal. TNF-α is a cytokine secreted by leucocytes and endothelial cells in response to a damage, and its production is stimulated by interleukin 1 (IL-1). By binding to its receptors, TNFR-I and TNFR-II, TNF-α was shown to lead to NLRP3 activation when cells were exposed to ATP or silica as a second signal ●. TNF-α induces caspase-1 activation and IL-1β secretion in macrophages and dentritic cells (DCs) ●. It acts by regulating NF-κB pathway and via gene transcription ●. NF-κB is a transcription factor. When TNF-α interacts with its receptor, the NF-κB pathway is triggered and NF-κB enters into the nucleus to activate the transcription of the nlrp3 and il1b genes. That leads to NLRP3 and pro-IL-1β production. Other cytokines, IL-1α and IL-1β, were shown to prime NLRP3 inflammasome in macrophages and DCs ●. These could explain how NLRP3 is constantly primed in chronic inflammatory diseases: IL-1 is secreted following NLRP3 inflammasome activation and TNF-α production is induced by IL-1; the inflammatory process, by leading to the production of these cytokines, allows the priming of the NLRP3 inflammasome, thus maintaining the inflammation. It is possible that TNF-α also primes NLRP3 in Alzheimer's disease because the peptide amyloid-β - which aggregates and forms fibrils in Alzheimer's disease - stimulates the release of TNF-α by microglia that is the brain resident macrophage . Oxidized low density lipoprotein (oxLDL) and amyloid β fibers can also prime NLRP3 in atherosclerosis and Alzheimer's disease respectively, by interacting with TLR4-TLR6 heterodimer and the scavenger receptor CD36 . Recent studies showed that TLR4-TLR6 and CD36 actually work as a heterotrimeric signaling complex since IL-1β was not produced in cd36 −/−, tlr4 −/− or tlr6 −/− macrophages ●●. The different priming signals are shown in Figure 2. Figure 2. Priming signal in non-infectious context. Priming signal in non-infectious context. In sterile condition, TNF-α, IL-1α/β and oxLDL can prime NLRP3 by interacting with TNFR I/II, IL-1R and the heterotrimeric complex CD36-TLR4-TLR6 respectively. Then NF-κB pathway is triggered and lead to the expression of the genes of NLRP3 and pro-IL-1β. NLRP3, ASC and pro-caspase 1 assemble to form the NLRP3 inflammasome. The sensing domain LRR of NLRP3 could receive the 2nd signal. After NLRP3 inflammasome activation by crystal structures, pro-IL-1β is cleaved in IL-1β and secreted. To activate NLRP3, crystals need first to be internalized into cells by phagocytosis. Then it is not well understood how crystals trigger NLRP3 activation. Crystals probably do not interact directly with NLRP3 but trigger different mechanisms that could act simultaneously to activate NLRP3, such as ROS production, potassium efflux or lysosomal proteases release. One common feature during NLRP3 activation by particulate matter is the phagocytosis of the crystal structures. Phagocytosis is an active mechanism allowing some cells (the phagocytes) to incorporate big extracellular elements and other cells by rearranging their actin cytoskeleton, in order to eliminate them. Usually, phagocytosis is activated by ligand-receptor interaction. MSU crystals are internalized by phagocytosis in neutrophils and macrophages in gout disease ●●. In atherosclerosis, macrophages phagocytose cholesterol crystals [13,14]. Phagocytosis is also observed with silica crystals, aluminum salts and asbestos fibers [11,20]. It was shown that inhibition of phagocytosis in presence of these crystals inhibits NLRP3 activation, thus establishing a direct link between crystals phagocytosis and NLRP3 activation [11,13,20]. In all these cases, it is not well established how crystal structures trigger phagocytosis. Studies on MSU crystals suggest that particulate matter could be internalized into cells in a receptor-independent manner by engaging directly the cell membranes and altering the membrane lipids . This modification would trigger a pathway involving the spleen tyrosine kinase (Syk), a member of the Syk family of tyrosine-kinases, and the phosphoinositide 3-kinase (PI3K) . However, some nano-particles as nano-TiO2 and nano-SiO2, despite activating NLRP3, are internalized without the need for particulate phagocytosis . And for cholesterol, the formation of crystals can also occur inside the cell by accumulation of free cholesterol derived from low density lipoproteins (LDL) which are internalized via LDL receptor-mediated endocytosis and then turned into free cholesterol by acid cholesterol ester hydrolases [14,20]. Furthermore, oxLDL were shown to be internalized via their interaction with CD36 and then to form crystals when accumulated inside the cells since crystal structures appeared into wild type macrophages cultured in presence of oxLDL and did not appear in cd36 –/– macrophages ●●. Thus oxLDL are able to provide signal 1 and signal 2, allowing NLRP3 activation and modest IL-1β production without any other stimulus ●●. The different ways to internalize particulate material are described in Figure 3. Figure 3. Models of NLRP3 activation by crystal structures. Models of NLRP3 activation by crystal structures. Following phagocytosis of crystals and merge of the phago-lysosome, the enzyme NOX at the membrane of the phago-lysosome may be stimulated and produce ROS. Crystals lead to lysosomal membrane rupture which releases cathepsin B and other proteins into the cytosol. The released proteins may trigger ROS production by disrupting mitochondria and may lead to K+ efflux. ROS induce Ca2+ entry. Cathepsin B, K+ efflux and Ca2+ may trigger NLRP3 inflammasome activation, directly or not. ROS could activate NLRP3 directly or not, for example via TXNIP activation. Alternatively, cholesterol has been proposed to enter into the cell in the form of oxLDL by endocytosis and then crystallize inside the endocytic vesicle, which fuses with lysosome to form endo-lysosome. Once crystals are inside the cells, they lead to NLRP3 activation. Because it is unlikely that NLRP3 is a specific sensor for each crystal structure since all these particles have very different compositions, it is thought that the different crystals act via common mechanisms to activate NLRP3. Lysosome rupture and cathepsin B leakage is one of the proposed models. During phagocytosis, the phagocytosed material is incorporated in a huge vesicle called phagosome. Then the phagosome fuses with lysosome to obtain phago-lysosome. Lysosomes are cellular organelles that digest the material internalized by phagocytosis following fusion with phagosomes, but can also eliminate damaged components of the cell or small material internalized by endocytosis. They have acidic pH that activates the lysosomal enzymes used for the digestion, including proteases. In the case of crystal structures phagocytosis, lysosomes fail to eliminate the phagocytosed material, which can lead to “frustrated phagocytosis”: the material, resistant to digestion, is exocytosed. Crystal structures, due to their big size and sharp edges, can drill the lysosomal membrane. Rupture of the lysosomal membrane release proteases including cathepsin B which activates NLRP3 directly or indirectly ●●. Cholesterol crystals were shown to trigger cathepsin B leakage and when this enzyme was inhibited, IL-1β secretion decreased, suggesting that lysosomal destabilization is involved in NLRP3 activation mediated by crystal structures . Silica crystals and aluminum salts were also shown to activate NLRP3 through lysosomal membrane destabilization and cathepsin B release since in presence of these crystals, cathepsin B leakage was observed and was linked to caspase 1 activation, and inhibition of cathepsin B decreased IL-1β production . The role of lysosome rupture and cathepsin B leakage in NLRP3 activation is represented on Figure 3. Some studies establish a link between lysosome rupture and reactive oxygen species (ROS) production. It was shown that ROS are produced on a cathepsin B-dependent manner in response to viral infection or following α-synuclein endocytosis [28,29]. Reactive oxygen species (ROS) production is obviously linked to the inflammatory process and to the activation of the NLRP3 inflammasome, but the mechanism involved remains poorly understood. IL-1β secretion was inhibited in human monocytes pre-incubated with the ROS inhibitor N-acetyl-cysteine (NAC) and then stimulated by MSU, suggesting that ROS are indeed important for NLRP3 activation . ROS inhibition in presence of asbestos blocked NLRP3 activation too, showing that the ROS-dependent NLRP3 activation mechanism is triggered by different crystal structures . There are 2 possible sources of ROS into the cells which could lead to inflammasome activation: NADPH oxidase (NOX) and mitochondrial ROS. NOX is an enzymatic complex located at the membrane of the phogolysosomes which converts NADPH in NADP+, releasing superoxide anion O2 -. Following particles phagocytosis, the inefficient elimination of the phagocytosed material can cause a “frustrated phagocytosis” which results in exaggerated NOX activation and excessive ROS production ●●. It was shown that inhibition of NOX clearly reduces ROS production, leading to decreased IL-1β secretion in presence of NLRP3 activators, which suggests that NOX originated ROS play an important role in NLRP3 activation . Since mitochondria is the main source of cellular ROS, it was investigated if mitochondrial ROS can also trigger NLRP3 activation. Inhibition of complexes I and III of the respiratory chain led to robust ROS production, increasing IL-1β secretion in a dose-dependent manner, which confirms that mitochondrial ROS are involved in inflammasome activation . ROS production could be induced by released lysosomal proteins following lysosome rupture, which disturb the functioning of the mitochondria [28,29]. It is not well established how ROS trigger NLRP3 activation. A study suggests that ROS could act via the thioredoxin-interacting protein (TXNIP), a protein linked to insulin resistance which is associated to the thioredoxin (TRX) in the cytosol ●. It was shown that under high concentrations of ROS inside the cells following MSU internalization, TXNIP dissociates from TRX and binds directly NLRP3, which leads to IL-1β secretion ●. Thus, in this model, ROS produced by NOX and by the mitochondria following crystal uptake release TXNIP which then interacts with NLRP3 and activates the inflammasome. ROS could also activate transient receptor potential melastatin 2 (TRPM2), a calcium channel by which Ca2+ enters into the cell . Ca2+ influx is thought to be involved in NLRP3 activation (see Figure 3) ●●. ROS-dependent NLRP3 activation is represented in Figure 3. However, some authors think that ROS are not important for NLRP3 activation but are involved in the priming step. Hornung et al. showed that ROS inhibitors block priming, but not activation of NLRP3 . Other results show that ROS are not necessary for both NLRP3 priming and activation ●●. Intracellular K+ decrease is often observed in NLRP3 activation mechanisms. It was shown that K+ efflux precedes release of IL-1β induced by silica, aluminum and CPPD, suggesting that K+ efflux is required for NLRP3-dependent IL-1β secretion ●●. Inhibition of K+ efflux in presence of MSU crystals and other inflammasome activators prevents NLRP3 activation . K+ efflux appeared to be linked to crystals phagocytosis since phagocytosis inhibitors including cytochalasin B and latrunculin B impaired both K+ efflux and IL-1β secretion ●●. It is not known how K+ release mediates inflammasome activation but intracellular K+ decrease is not sufficient to activate NLRP3 ●●. K+ efflux seems to also be linked to lysosomal destabilization and extracellular Ca2+ activates NLRP3 via K+ release (see Figure 3) ●●. K+ efflux is also associated to ROS production, and although the interplay between these two pathways is unclear, intracellular K+ decrease could trigger ROS production or vice-versa ●●. Figure 3 shows how K+ efflux is involved in NLRP3 activation. NLRP3 inflammasome is expressed in innate immune cells, including monocytes, macrophages and neutrophils. Most of the time these cells incorporate crystal structures by phagocytosis, apparently in a receptor-independent manner. But they can also be internalized by endocytosis in a receptor-dependant manner (LDL and oxLDL). Crystal uptake constitutes the 2nd signal for NLRP3 activation. Once in the cell, it is not yet well understood how crystal structures activate NLRP3 inflammasome. Crystals in phagolysosomes trigger production of ROS by lysosomes which could activate NLRP3 directly or not. Crystal structures may also destabilize lysosomal membrane, releasing lysosomal proteases like cathepsin B into the cytosol. 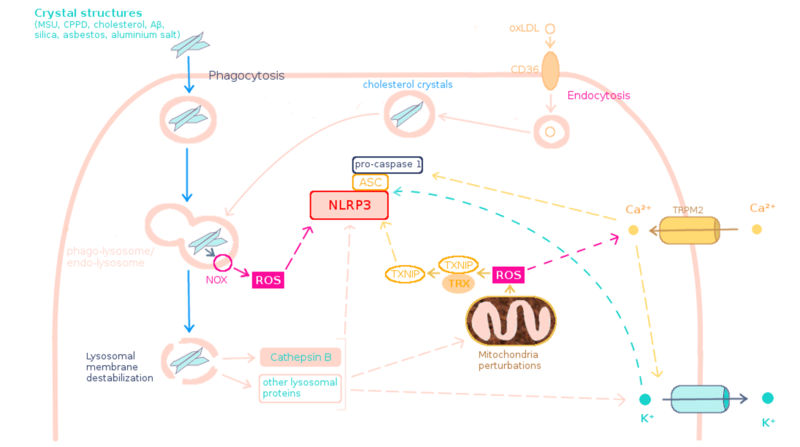 Cathepsin B may activate NLRP3 directly or not (K+ efflux and mitochondria perturbations). Mitochondrial ROS, K+ efflux and Ca2+ entry could also play a role in NLRP3 activation. The different models of NLRP3 activation are not strictly independent from each other since cathepsin B could lead to mitochondria perturbations and K+ effux, ROS can trigger Ca2+ entry and calcium intake could induce K+ efflux. The activation of the inflammasome leads to pro-IL-1β cleavage by caspase 1 and IL-1β secretion, which triggers the inflammatory response, recruiting leucocytes. Crystal-induced NLRP3 activation needs priming signal too, as in microbial inflammation. Here the first signal is given by oxLDL, TNFα or IL-1 family cytokines which interact with receptors and then trigger the NF-κB signaling pathway, leading to nlrp3 and il1b genes transcription. NLRP3 is activated by crystal structures in several chronic diseases but also in non pathogenic contexts like with aluminum salts or TiO2 and SiO2 nanoparticles. In diseases, chronic inflammation causes the pathology (gout, pseudogout, atherosclerosis) or participates in pathogenesis (Alzheimer's disease). Thus therapies in which inhibitors of the NLRP3 inflammasome are used could be envisaged. I would like to thank Renaud Mahieux and Bénédicte Py for their availability and their comments. 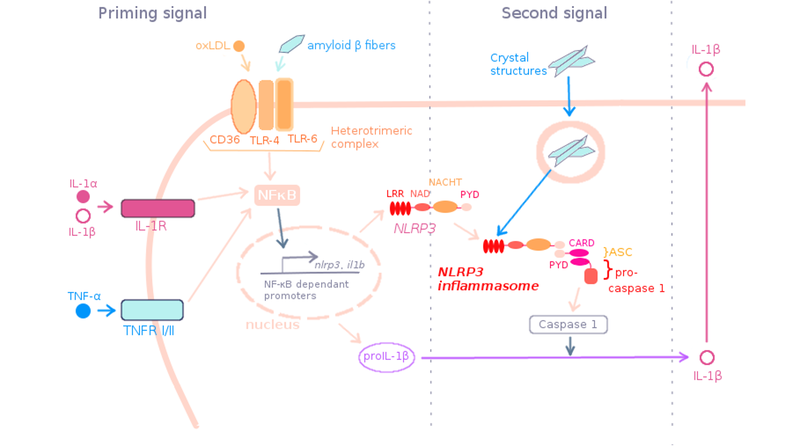 ● In this review, the authors present how the inflammasomes, including NLRP3 inflammasome, are activated and regulated. ●● In this review, the authors propose several models of activation of the NLRP3 inflammasome by microbial activators and sterile particulate activator, including ROS model and lysosome rupture model. ● The authors review the mechanisms that trigger NLRP3 activation following urate crystals uptake, including ROS production by NOX. ●● This review presents the effect of cholesterol crystallization on inflammatory responses in atherosclerosis, via NLRP3 activation following cholesterol crystals, oxLDL and LDL uptake. ● This review focuses on inflammatory responses triggered in sterile situations, in particular by particulate matter, and tackles the diseases caused by these particles. ●● By dosing IL-1β released from the cell and using phagocytosis inhibitors, the authors show that silica crystals and aluminum salt crystals trigger NLRP3 activation via lysosomal membrane destabilization following their phagocytosis. ● By measuring IL-1β secretion and caspase 1 activation, and by using nlrp3 deficient mice, the authors show that TNF-α primes the NLRP3 inflammasome, making possible its activation by silica crystals. They also show that TNF-α induces IL-1β secretion by interacting with TNFR-I/II. ●● These results show that oxLDL and Aβ fibers can prime NLRP3 by interacting with CD36-TLR4-TLR6 heterotrimeric complex and that oxLDL can crystallize inside the cells after endocytosis following interaction with CD36. ● The authors show that ROS could trigger NLRP3 activation by dissociating the TRX-TXNIP complex, allowing TXNIP to activate NLRP3. ●● The authors show that K+ efflux is involved in NLRP3 activation by bacterial toxins and particulate matter, using K+ efflux inhibitors. They also show that ROS production is not required for NLRP3 priming or activation.